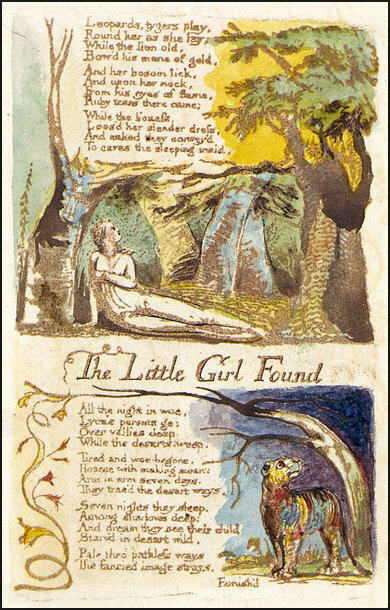 This poem is the follow up to “The Little Girl Lost” (click here to read my thoughts on that poem). While I struggled to get a sense of the first poem, I found this one to be more unified and easier to interpret. 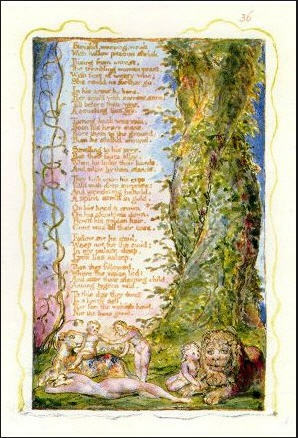 Since the poem is fairly long, I am including a link to read it online, rather than including the text within this post. The first half of the poem has the mother and father searching the desert for their lost daughter, Lyca. I see the parents as symbolic of the god and goddess. Their child, having fallen from grace, is now lost in the wilderness. During their search, they encounter the lion. At first it seems that the lion will attack the parents, but then proves to be caring and protective. The lion transforms into a powerful, protective spiritual being. This being could be either an archangel or a Christ figure. The lion then guides the parents to his den, where they are reunited with their daughter. Although the girl is living among “tygers wild,” she is being protected and appears to be unharmed. Blake seems to be implying that in order to live in the world, you must have spiritual protection; otherwise you fall prey to the ravages of society. The poem ends on a bittersweet note. The parents and Lyca are protected, but there is a cost. They are alone in the world. Once you choose the spiritual path and accept the protection of a divine being, then you can no longer be a part of society, or at least, not as you were before. Years ago I made a major life change which put me on a spiritual path. When this happened, I experienced the consequences of losing some friends who were close to me at the time. Our relationships were different; we were on different paths. I was sad at first, but I accepted it. As we go through life, we change and sometimes the people we are close to change in different ways. Rather than dwelling in sorrow over things like this, I choose to be grateful for the time we had together, sharing part of the journey. 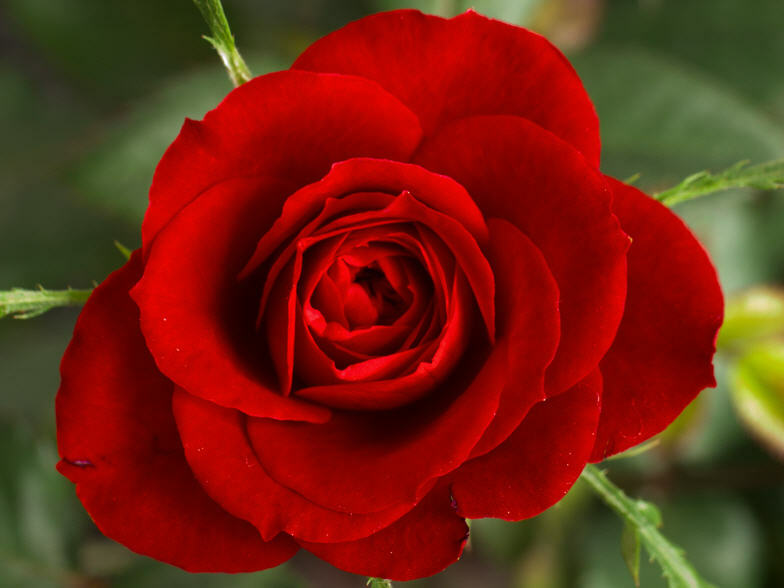 Thanks for taking the time to read my blog, and I hope you have a blessed day. This book has been on my list for a while and I finally got around to reading it. Essentially, it’s a collection of tales from Norse mythology. As I started reading it, I quickly learned that I had to disregard all the introductory text, as well as the footnotes. It may have just been the translation, but the sheer volume of academic blather and mental masturbation that was wasting pages almost made me delete the book from my reader. Once I skipped over all the analysis and got into the actual text, though, it got much more interesting. As with many epics, there are sections that contain lists of names, and you can drive yourself crazy trying to remember them all, especially since the gods and persons in the book are referred to by multiple names. I didn’t spend a lot of energy trying to keep track of everyone, but instead focused on the stories. The first thing that struck me about this text is how much it inspired Tolkien’s Lord of the Rings trilogy. I wasn’t completely surprised by this, since I recall reading about it somewhere. 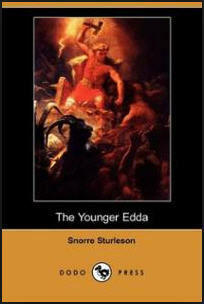 Yet it seems that Tolkien borrowed not just the epic style, but he also took names from the Edda. I was surprised to see Gandalf’s name appear in the Edda. The earlier part of the book deals with the creation myth and it was interesting to compare the Norse version to other creation myths. For example, the god Surt seems a combination of divine beings from other texts. He is similar to the cherubim and St Michael the Archangel, with the sword of flame. He also seems to embody aspects of Shiva, the destroyer of worlds. Surt is the name of him who stands on its border guarding it. He has a flaming sword in his hand, and at the end of the world he will come and harry, conquer all the gods, and burn up the whole world with fire. There are some interesting differences, too. The one that stands out the most for me is that when the moon and sun are created, the genders attributed to them are the reverse of what is common. In everything that I have read so far, the sun is associated with masculine energy, while the moon with its cycles is symbolic of the feminine. Not so in the Norse mythology. The sun knew not Where her hall she had; The moon knew not What might he had; The stars knew not Their resting-places. I thought about how this type of gender reversal would affect the symbolism of the sun and the moon. I suppose in the cold north, the sun becomes a symbol for birth, life, and regeneration, causing plants to spring from the earth. The moon, associated with might in the text, has the power to shift the tides, a power that certainly must have been important to the Vikings. So the symbolism attached to these astral bodies makes sense when you look at it from that perspective. That’s the thing about symbols—they mean different things to different people. Although the god Thor figures prominently in the text, I’m not going to say much about him. Personally, I found Thor to be arrogant and prone to hubris. It was like his attitude was always: If I hit it hard enough with my hammer, I’ll get what I want. Thor’s flaw as a hero is that he doesn’t really use his brains as much as he should. It’s all brawn for Thor, which is his defect, in my opinion. Loke, on the other hand, I found infinitely fascinating. He is like Lucifer, Prometheus, Anansi, and Odysseus all rolled into one. He is beautiful; he is a trickster; he is sharp and cunning; he is the embodiment of all the things that make a character thrilling and interesting. There is yet one who is numbered among the asas, but whom some call the backbiter of the asas. He is the originator of deceit, and the disgrace of all gods and men. His name is Loke, or Lopt. His father is the giant Farbaute, but his mother’s name is Laufey, or Nal. His brothers are Byleist and Helblinde. Loke is fair and beautiful of face, but evil in disposition, and very fickle-minded. He surpasses other men in the craft called cunning, and cheats in all things. He has often brought the asas into great trouble, and often helped them out again, with his cunning contrivances. Loke, according to the Norse mythology, is the father of the ourosboros, which for me is one of the most powerful symbols. I was kind of surprised by this. I had always viewed the ourosboros as a symbol for cycles and eternity and had never considered that it was created by another divine entity. Loke had yet more children. A giantess in Jotunheim, hight Angerboda. With her he begat three children. 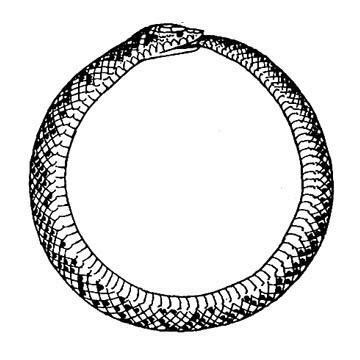 The first was the Fenris-wolf; the second, Jormungand, that is, the Midgard-serpent, and the third, Hel. When the gods knew that these three children were being fostered in Jotunheim, and were aware of the prophesies that much woe and misfortune would thence come to them, and considering that much evil might be looked for from them on their mother’s side, and still more on their father’s, Alfather sent some of the gods to take the children and bring them to him. When they came to him he threw the serpent into the deep sea which surrounds all lands. There waxed the serpent so that he lies in the midst of the ocean, surrounds the earth, and bites his own tail. I feel like I could write an entire book on Loke. He is by far the most interesting character in the Edda. But, I want to talk about Odin for a little bit, so I will say farewell to Loke, for now. Odin taught the magical arts to the priests and priestesses of old. Essentially, all magic, witchcraft, and sorcery was passed down from the Alfather. He taught all these arts in runes and songs, which are called incantations, and therefore the Asaland people are called incantation-smiths. Odin also understood the art in which the greatest power is lodged, and which he himself practiced, namely, what is called magic. By means of this he could know the predestined fate of men, or their not yet completed lot, and also bring on the death, ill-luck or bad health of people, or take away the strength or wit from one person and give it to another. But after such witchcraft followed such weakness and anxiety, that it was not thought respectable for men to practice it; and therefore the priestesses were brought up in this art… From these arts he became very celebrated. His enemies dreaded him; his friends put their trust in him, and he relied on his power and on himself. He taught the most of his arts to his priests of the sacrifices, and they came nearest to himself in all wisdom and witch-knowledge. Many others, however, occupied themselves much with it; and from that time witchcraft spread far and wide, and continued long. This is not an easy book to read. It is very dense and the language is archaic. That said, if you are interested in mythology, magic, and the occult, it is a must read. I am glad that I persevered and finished the book. It was very insightful for me. As always, feel free to share your thoughts and comments. Thanks.